and what are your dreams made of? My dreams include supporting myself through my Etsy shop and my blog, which means I have to start focusing more on my business. So happy that I have been able to put some things behind me in the last few months and that I am able to start doing what I love again. Yesterday I hit some thrift stores and today I am heading out to an auction. Time to get my shop stocked up for the fall buying season. See you back here tomorrow, and don't forget to dream. I have confidence in you!! Great positive attitude and good luck at the auction. Positive thinking can CHANGE your life! It will only help you even more to make your dreams a reality. Love this inspirational message. Glad to hear that you're at a good place in your life now and can begin to move in the direction of your dreams. Good to hear you are back into your Etsy shop. Love the items you find and sell! Happy for you! Yes, dream and go forth confidently! After your shopping trip, I'm going to have to check out your Etsy shop! Stay positive we're all rooting for you! This is a very positive and inspirational post. Thanks for the encouragement and the vote of confidence! May the deals go your way on your shopping spree! Laura... can't wait to see all your goodies!!! Good for you Laura. Being positive is important in life, I believe. We'll dream together about what we love to do bringing in enough to live on. 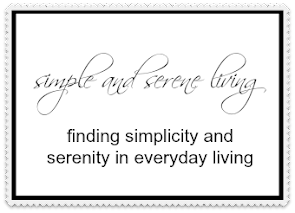 Laura, I love your positive attitude "in pursuit of the simple life." I have that quote in a frame!